Booking Fort Myers saltwater fishing charters with Catch Me If U Can Fishing Charters will put you on the front lines of the best back country inshore fishing in Florida. Our Southwest Florida shores are known as the tarpon fishing capital of the world. Fort Myers is built on the banks of the Caloosahatchee River, which begins at Lake Okeechobee, and empties into the Gulf of Mexico at Cape Coral next to Fort Myers Beach. The nutrient rich waters provided by this large river system, as well as the many other smaller inlets around makes for some incredibly fertile river fishing as well as saltwater fishing. Fort Myers, located on the Southwest Florida coast, has the best back country inshore saltwater fishing charters in Florida. The Fort Myers area, including Pine Island Sound, Matlacha Pass, and Charlotte Harbor, features fertile grass flats, mangrove lined shorelines, oyster beds, and inlets that are home to a wide variety of sport fish species including tarpon, snook, mackerel, redfish, shark, and speckled trout. 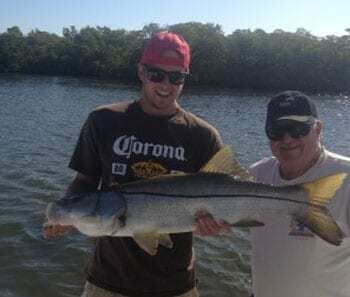 Many anglers book Fort Myers fishing charters in pursuit of the famous “Backcountry Slam”- catching snook, redfish and speckled trout all on a fishing charter. And those that complete the “Backcountry Slam” agree that Catch Me If U Can saltwater fishing charters was their best fishing trip. These popular sport fish species are available year round in the Fort Myers area and catching a “slam” is an anglers dream come true. The shallow, crystal clear waters around Pine Island just offshore from Fort Myers are a Florida sport fishing dream come true. Predominately grass flats, Pine Island Sound boasts schools of redfish and speckled trout all year round, while snook and tarpon migrate to this area in spring and summer to spawn. Charlotte Harbor, on the north side of Fort Myers, is the second largest bay in the State of Florida, next to Tampa Bay. Mangrove lined shores and extensive grass flats make Charlotte Harbor one of Fort Myers’ prized coastal fishing locations. Mackerel, ladyfish, bluefish, cobia, flounder, snook, redfish, and speckled trout all call Charlotte Harbor home. Matlacha Pass is a little known waterway that links the Caloosahatchee river to Charlotte Harbor. As the outlet to the Caloosahatchee River, Matlacha attracts a great number of sport fish throughout the year including tarpon, speckled trout, jacks, black drum, redfish, and snook. Fort Myers saltwater fishing charters are truly an angler’s dream. Year round great weather and great fishing make it a must-fish destination for any backcountry fishing enthusiast. 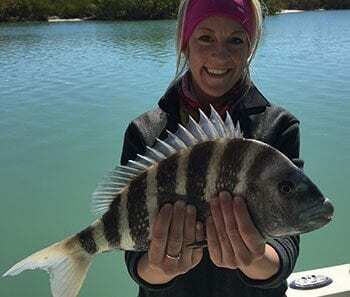 Book your Fort Myers saltwater fishing charter with Catch Me if You Can Fishing Charters today and experience the thrill and excitement of the ultimate Fort Myers fishing adventure.